Help more people and make a lasting impact by becoming a Road to Status Certified Attorney Network Partner! Save time and money and pay it forward in the form of savings to your clients. Custom solutions to serve your firm’s needs and the needs of your individual clients. Focus on legal strategy, research, and litigation and spend less time chasing and completing paperwork manually. Safely share and store all of your paperwork in one secure place. Schedule appointments, manage conversations, track client activity from one dashboard. Co-branding options incorporate your firm’s logos and style. Access all available tools and services from one easy to manage, multi-lingual platform. Work from any screen, at any time. Fully integrated desktop and mobile tools make working from anywhere easy and safe. Access to expert implementation, training, and support from our immigration specialist and technology teams. Request a Demo Today. Partner with Us Tomorrow. It’s that easy. 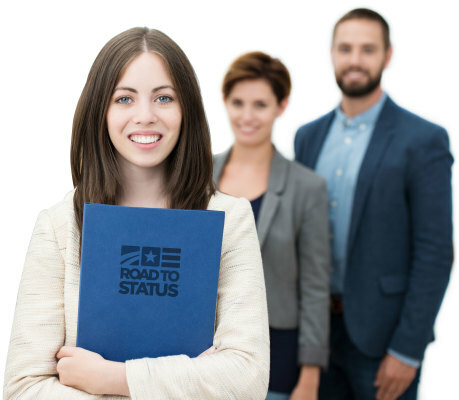 For more information on how you or your organization can team up with Road to Status, please complete the form below for a free, no obligation web demo of our platform. You can also email us, or call us at (857) 600-0972. Choose One ---I primarily provide family-based immigration services and I would like more information.I primarily provide employment-based immigration services and I would like more information.I primarily provide immigration services not listed here and I would like more information. Help more people than ever before and make a lasting impact by becoming a Road to Status Partner! Custom branded solutions to serve your organization’s needs and the needs of your constituents. Nonprofit pricing and promotional offerings make it easy to partner and save. Reach more people than ever before and make a lasting impact on individuals and their families. We’re always on the lookout for like-minded individuals and organizations who share our passion for helping people realize their American dreams. We are actively seeking partnerships with trusted nonprofits, local community organizations, law firms, sole-proprietor immigration attorneys, charitable and religious groups, media and private sector companies who are interested in helping us revolutionize and improve the broken American immigration system. Take a look at our current partners here.